With a chest of drawers you can easily create more storage space in the bedroom. It is a useful piece of furniture for clothing and linen. You will find here commodes in white, but also in modern colors. Simple as well as design. These timelessly designed storage furniture also fits perfectly in all other rooms in your house. A chest of drawers is usefull in the hall, bathroom and living room. 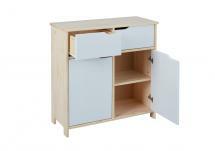 For all possibilities, see also the design drawers in the storage furniture category.